Stories of water pollution are always big when they hit the news — after all, we depend on it to survive, and any compromise in quality can endanger our physical health and that of our communities. Over 83,000 core professionals work to keep our groundwater, surface water, drinking water and wastewater safe from pollution, but over 400,000 professionals use “water quality skills” in their roles. New, increasingly tough regulations for governments and organizations have given rise to increased opportunity for those professionals and other interested in this sub-sector. Roughly 34% of employers expect a rise in staffing levels for water quality experts. Demographic shifts will come into play, too, as around 18% of professionals retire over the next 10 years. What’s driving this increase compliance? Climate change, population growth, and urbanization all stress our water resources, requiring we take a hard look at how we use and protect this resource. Who’s employing these water quality specialists? Increasingly, green building employers are seeking professionals with water quality skills. Public utilities and administration were also top employers. Employers of chemists, hydrogeologists, water quality engineers and environmental engineers are most likely to expect to hire more water quality professionals in the future. Want to learn more? 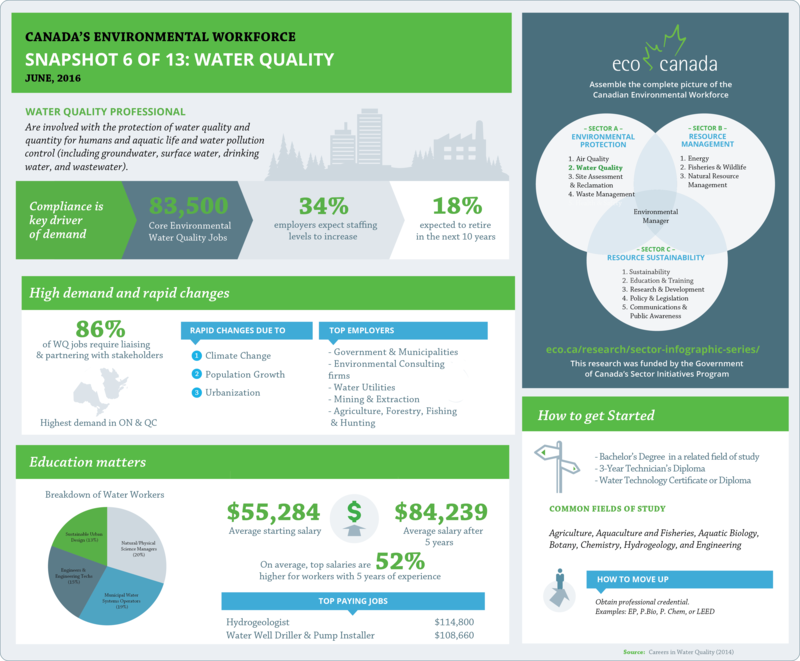 Take a look at the monthly snapshot below for an overview of the challenges and opportunities in the Water Quality sub-sector.